HKSAR Film No Top 10 Box Office: [2017.10.16] JOHN WOO CALLS HA JI-WON THE "FEMALE CHOW YUN FAT"
[2017.10.16] JOHN WOO CALLS HA JI-WON THE "FEMALE CHOW YUN FAT"
MANHUNT two nights ago held its Busan Film Festival premiere. 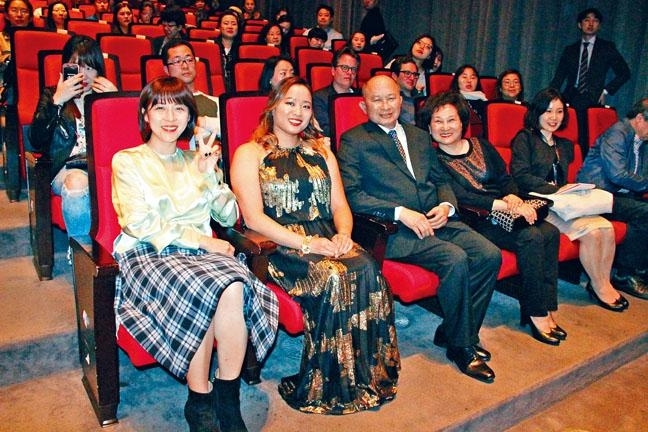 Director John Woo (Ng Yu Sum) and his wife, daughter and actress Angeles Woo Fei Ha and lead actress Ha Ji-Won attended and enjoyed the new film with the audience. Their appearance caused a stir. After the screening the audience applauded passionately. Director Woo stood up and waved to the viewers in a show of appreciation. Later at the forum, a viewer was very happy to see a lot of the director's unique style in the new film. Director Woo revealed that aside from the white doves and the twin guns he also had dance elements. He said, "I really like to dance, my wife and I met due to dancing. Actually gun fights and fight scenes are like dancing, they have to have beauty and rhythm." He also said that he thanked China's Zhang Hanyu, Japan's Masaharu Fukuyama, Korea's Ha Ji-Won and actors and crew members from all over for their professional quality contribution. On and off camera they were able to display the spirit of friendship that went beyond borders. Although the film was filled with Director Woo's classic style, he did not forget to innovate and add in new elements. He added a female killer and actress shooting a gun for the first time. Ha Ji-Won said that she felt honored to be the first. Director Woo also said that with Ha Ji-Won's good acting and agility, during the shoot he treated her like Chow Yun Fat! Ha Ji-Won was pleasantly surprised, bowed to the director and shook his hand in appreciation. She said, "I didn't expect Director Woo would say that, this time I probably wouldn't be able to sleep from being so happy!" She also revealed that Director Woo taught her when shooting and fighting in the film to focus on emotional expression. As the event ended, the audience rushed up with gifts for them and asked for photos and autographs passionately. In addition, Stephy Tang Lai Yun has been busy at the Busan Film Festival. Yesterday was her birthday. Although she did not have to celebrate but the team thoughtful prepared a cake for her. Stephy thanked everyone online. "I watched a movie that I have looked forward to for a long time on my birthday today. My feelings are very complicated, happy, nervous, moved! I believe this is probably the best birthday present this year. Thank you Director, thank you to each actor. You are the greatest. Thank you for the surprise as well."